From both a regulatory and commercial perspective, companies should work with their suppliers (contract manufacturers) to ensure that they receive materials and services in line with predetermined specifications covering quality, volume and delivery. Some companies limit the Supplier Qualification process to the creation of a supplier contract. However, this approach is usually insufficient when it comes to specifying the tasks, responsibilities and duties of each party as regards product quality and testing. “Contract manufacture and analysis must be correctly defined, agreed and controlled in order to avoid misunderstandings which could result in a product or work of unsatisfactory quality. […] The contract must clearly state the way in which the Qualified Person releasing each batch of product for sale exercises his full responsibility” (extract from the Rules Governing Medicinal Products in the European Union, Volume 4, Good Manufacturing Practice, Chapter 7, Contract Manufacture and Analysis). 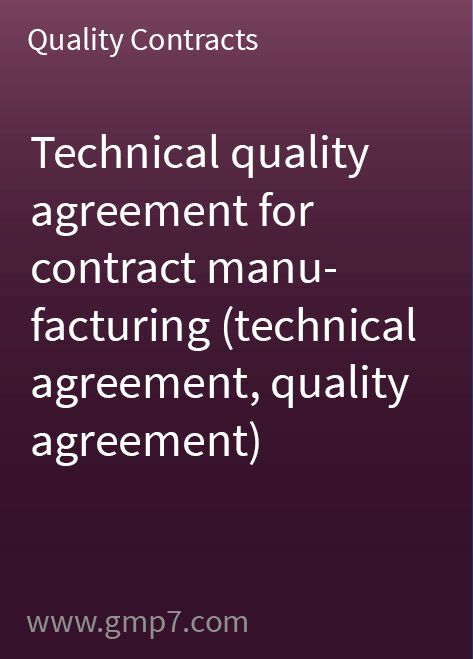 This master document template for technical quality contract manufacturing, which is over 35 pages in length, clearly defines the duties of the Contract Giver and the Contract Acceptor and is extremely beneficial for both parties. The template specifies all the arrangements, agreements and controls needed to avoid misunderstandings that could result in a product or work of unsatisfactory quality. It includes nine attachments that cover the details of processes, materials, IPC, product specifications, stability, customers and labels. This ready-to-use template only needs a small amount of site-specific modification before you can adopt it in its entirety for your operations. All you need to do is enter your site-specific information in the coloured fields that are marked. When was this document created? How old is the information? Dear Mr. Raindl, we are constantly updating our templates according to new and updated regulatory requirements or costumer feedback.